I was born and raised in Hawai‘i and have been a faculty member at the University of Hawai’i for more than 30 years. Most of my career has been spent in the classroom where I enjoy my interaction with students. I teach courses on practically everything: French language, poetry, the novel , Francophone literature. Recently I was able to offer a seminar on Beckett. After becoming Interim Associate Dean of LLL, I was able to teach only one course a semester. Besides scholarly endeavors I also write poetry and short stories. Beckett’s Game: Self and Language in the Trilogy, Peter Lang Publishers, 1991. Literary Relations East and West, co-edit with Nobuko Ochner, LLL/UH Press, 1990. What the Kite Thinks, a book of linked poetry and commentary with Ooka Makoto, Wing Tek Lum, and Joseph Stanton, UHM Outreach/UH Press, 1994. No Choice by to Follow, a book of linked poetry and commentary with Ann Inoshita, Juliet Kono and Christy Passion. 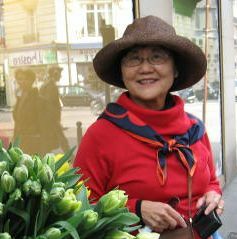 Essay on linked poetry by Jean Toyama, Bamboo Ridge Press, 2010. • Kelli’s Hanauma Friends, a book of poems and art about Hawaiian reef dwellers with paintings by Russell Sunabe, 2010. Kelli’s Hanauma Friends, a book of poems and art about Hawaiian reef dwellers with paintings by Russell Sunabe, 2010. If you need an alternative format for any of the media on this website, please email llea464@hawaii.edu.